Home / baseball / CM / MiLB / Rochester / Rochester Red Wings / Sports / Red Wings present Naked Mole Rat Cap Giveaway on July 16! 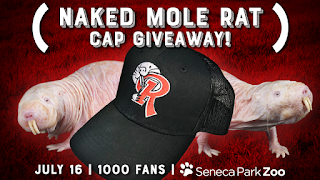 Red Wings present Naked Mole Rat Cap Giveaway on July 16! ROCHESTER, N.Y. -- The Rochester Red Wings have teamed up with Seneca Park Zoo to celebrate the Naked Mole Rat on Monday, July 16 as part of their upcoming "Animals of the Savanna" Expansion coming in August. The Wings will be giving away 1,000 Naked Mole Rat hats that depict the unique creature peaking around the side of the Red Wings "R". The team will also be wearing the caps that will be auctioned off to benefit the Seneca Park Zoo Society. Scientists are currently studying the biochemistry of Naked Mole Rats for their extraordinary abilities to resist cancer and diseases related to old age. More info on the Naked Mole Rat can be found here. The ZooMobile will also be here on July 16 with biofacts, information and four animals for fans to interact with. Every Monday, the first 500 kids eat FREE (hot dog, snack item and small soda) presented by Basch & Nickerson LLP. North of the current elephant barn, a four-acre expansion of A Step into Africa will feature animals of the Savanna. This new area will include an outdoor habitat for Masai giraffes, zebras, and ostriches, and a new habitat for rhinos. The expansion will also include the expansive Animals of the Savanna building, which will incorporate day rooms for the animals above, with habitats for other animals native to the Savanna, including naked mole rats, rock hyrax, a cichlid aquarium, an aviary, and much more. The expansion is scheduled to open in mid to late August.